What is the maximum thickness 120mm form factor top mounting radiator? Up to 70mm thick radiator with push/pull configuration. What is the maximum thickness 140mm form factor top mounting radiator? 45mm thick radiator with 25mm thick fans in push/pull configuration for a total of 70mm clearance. How much clearance for GPU(s)? -With Cover - Maximum 4 x VGAs (<10.12"/257mm) installed. PCI-E x16 must be available at first and third slots of the motherboard. 2. Maximum 4 x VGAs (<10.12"/257mm) and 80mm max diameter reservoir installed. What are the dimensions of the PH-TC14PE’s heatsink? What is the RAM limitation? 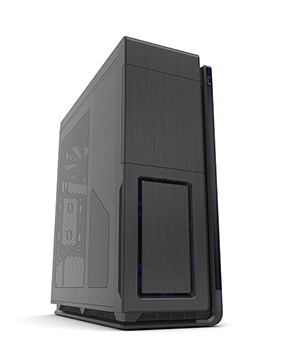 Due to the size of our cooler, PH-TC14PE with dual fans will cover over the RAM slots. The fan that is on the side of the RAM slots can be removed or move upwards for better RAM compatibility. Can I install fans with the depth of 38mm and how many fans are supported? As the distance between the two radiators is only about 28mm, you can’t install fans with more than 25mm in depth. It is possible however to install such fans on the front side of the cooler. Our PH-TC14PE supports up to 3 fans for maximum cooling performance. With Digital-RGB each LED chip has its own controller so it can be controlled individually. This allows for many color modes and patterns. Digital-RGB means that each LED chip can be controlled individually, allowing for multiple colors and effects in a single D-RGB LED strip. While regular RGB LED strips can only show the same color on each LED chip per strip at a time. However, not every Digital-RGB (Addressable) product is the same. Are plug-and-play. No software is needed, yet it is compatible with software control through MSI or ASUS compatible motherboards if desired. Have custom developed color patterns. We believe D-RGB lighting can be stylish when having the right color/pattern settings, which is why the Phanteks D-RGB controller is pre-installed with custom selected color modes and patterns. Have 30 LED chips. This is a lot! Having 30 LEDs per product instead of just 8 or 12 creates a much more beautiful color gradient and higher quality lighting. This also means more color tints can be displayed simultaneously in one strip. Why are Digital-RGB and RGB not compatible? Digital-RGB and RGB have a different connector. Digital-RGB uses a 3-pin connector while RGB uses a 4-pin connector. Technical explanation: Digital-RGB uses 5 Volts while RGB uses 12 Volts. Connecting Digital-RGB products and RGB products would cause damage. Is Digital-RGB compatible with my motherboard? Digital-RGB from Phanteks is compatible with Asus Addressable-equipped motherboards and MSI Mystic Light Rainbow-equipped motherboards. Check with the Motherboard specifications if your motherboard has a ‘AURA Addressable Header’ or a ‘Mystic Light Sync Rainbow header’ with 3 pins. How many D-RGB products can I connect to a compatible motherboard? Each D-RGB product uses 1 Ampere. Check the power output with your motherboards specifications to determine how many D-RGB products can be powered by your motherboards. Currently motherboards support 3 Amperes. How many D-RGB products can I connect to the D-RGB controller from Phanteks? The Phanteks D-RGB controller can support up to 7 D-RGB products when using the remote. If the D-RGB controller is connected to your motherboard a total of 9 D-RGB can be connected to the controller. A maximum of 4 D-RGB products can be connected to a single output port on the controller. How do I connect my D-RGB product from Phanteks to my Motherboard? Most of the D-RGB products and compatible motherboards include a motherboard adapter. Simply connect this motherboard adapter to the Addressable or Rainbow port on your motherboard and the Phanteks D-RGB products. D-RGB products from Phanteks can be daisy-chained so you only need one port on your motherboard. Most motherboards also include this motherboard adapter cable. Can I install multiple Digital-RGB controllers in my case? You can install as many D-RGB controllers as you would like. However they do not connect to each other. Each controller will work, and need to be controlled, individually. How do I turn off the D-RGB LED’s on the Phanteks D-RGB controller? Press and hold the ‘Mode’ for 2 seconds until the LED’s turn off. When using software control please consult with the motherboard manufacturer.